2016-06-10 - Research Visit of Roland Rau and Marcus Ebeling at Karolinska Institutet Stockholm. From left to right: Karin Modig, Roland Rau, Marcus Ebeling, and Sven Drefahl. From left to right: Anders Ahlbom, Sven Drefahl, Karin Modig, Roland Rau, Marcus Ebeling. Marcus Ebeling and Roland Rau in front of the "Nobel Forum" where the winner of the Nobel Prize in Physiology or Medicine is annually selected. To further advance their cooperation at the intersection of demography and epidemiology, Marcus Ebeling, MSc., and Prof. Roland Rau visited Prof. Anders Ahlbom and Prof. Karin Modig at their home institution, the Karolinska Institutet in Stockholm Sweden. Dr. Sven Drefahl, an alumnus of the University of Rostock, who is now at the University of Stockholm participated in the meeting as well. 2016-04-11 - Roland Rau appointed as "Max Planck Fellow". The president of the Max Planck Society appointed Roland Rau as a "Max Planck Fellow". He will remain full professor at the University of Rostock but he also leads a research group on "Mathematical and Actuarial Demography" at the Max Planck Institute for Demographic Research since 15 March 2016 for a duration of five years. 2016-03-28 - Paper published on the impact of cohort effects on life expectancy of Danish women. 2016-03-16 - Dr. Frederik Peters receives national award for doctoral dissertation. 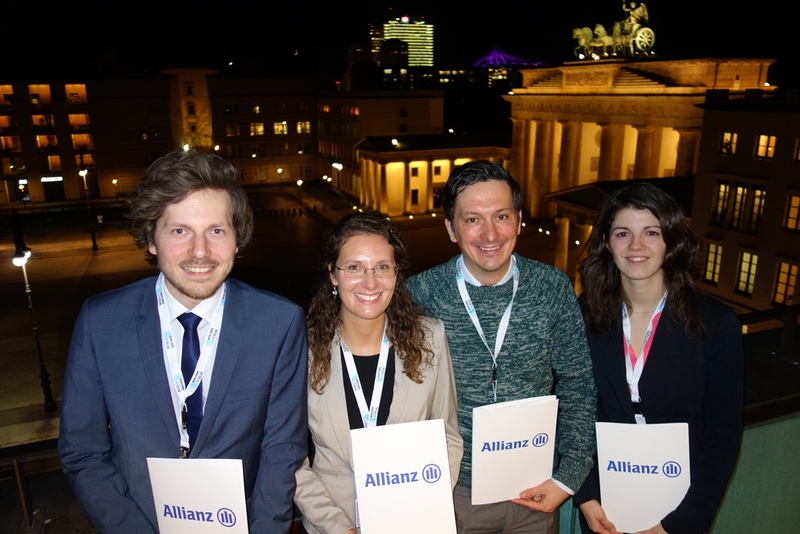 Dr. Frederik Peters (2nd from right) and the other three winners of this year's "Nachwuchspreis" are celebrating on the roof-top of the venue of the Berlin Demography Forum, close to the Brandenburg Gate. Dr. Frederik Peters from the Chair of Demography won one of the annual awards for young academics from the German Demographic Society (DGD) and Allianz for his doctoral dissertation on life expectancy developments in the Netherlands. He received the award during this year's Berlin Demography-Forum on February 24th, 2016. We are proud that two members of the Chair of Demography team were among the winners during the past five years. 2016-03-07 - University of Rostock produces movie clips to present researchers and their fields of interest. The University of Rostock plans to produce movie clips to present researchers and their fields of interest. On 26 February, members of the IT & Media Lab of the university filmed the Demography team and took some pictures. The "behind the scenes" photos presented here were taken by Jana Powilleit, head of communications at the University of Rostock. 2016-03-04 - Paper published on Forecasting Mortality and Life Expectancy in the US. 2016-02-18 - Paper published on life table estimation in Germany. Jointly with Felix zur Nieden and Marc Luy. The journal "Wirtschaft und Statistik" of the Federal Statistical Office in Germany published our paper Felix zur Nieden, Roland Rau, Marc Luy (2016) "Allgemeine Sterbetafel 2010/12 - Neue Ansätze zur Glättung und Extrapolation der Sterbewahrscheinlichkeiten" today - in German with English abstract. You can access the issue of Wirtschaft und Statistik or directly our paper. 2016-01-26 - Prof. Annette Baudisch zu Besuch am Lehrstuhl für Demographie. From left to right: Dr. Frederik Peters, Marcus Ebeling, M.Sc., Prof. Annette Baudisch, Prof. Roland Rau. Prof. Annette Baudisch vom Max-Planck Odense Center an der Universität von Süd-Dänemark besuchte den Lehrstuhl, um über gemeinsame Interessen in der Modellierung von Alterung und Sterblichkeit zu sprechen. 2016-01-22 - Besuch vom Karolinska Institutet in Stockholm. From left to right: Marcus Ebeling, M.Sc., Prof. Karin Modig, Prof. Anders Ahlbom, Prof. Roland Rau. Am 22. Januar 2016 kamen Prof. Karin Modig und Prof. Anders Ahlbom vom renommierten Karolinska Institutet in Stockholm nach Rostock und sprachen mit Prof. Roland Rau und Marcus Ebeling, M.Sc., über gemeinsame Forschungsthemen im Schnittbereich von Epidemiologie und Demographie.